Most of the discussion below has to do with something I saw doing course review (for the TDAA). I tried to explain to the designing judge a fundamental rule for dogs in motion, that “the dismount is dictated by the approach”. You probably know that I’ve been working on contacts in my training. This is the bit that I put up on the lower field. 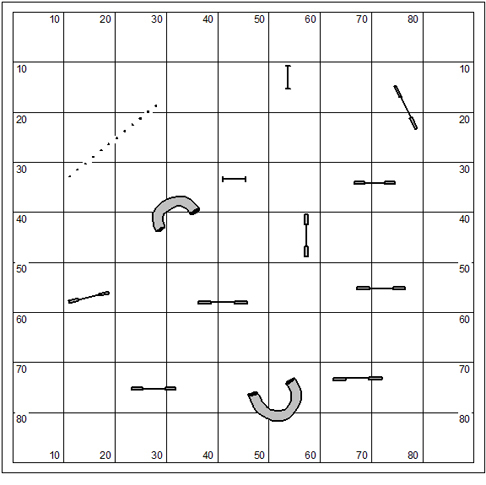 I tried to create a course design challenge comparable to the dog’s path problem shown in the first illustration. 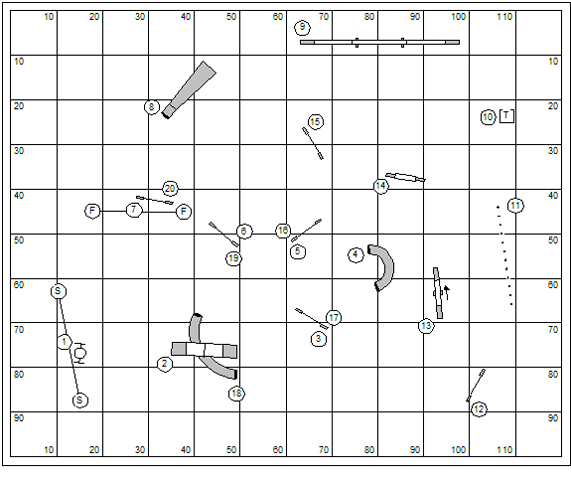 The real question is… is it an error in course design or a subtle and cruel riddle intended all along by the evil judge? Just in case you don’t see it… I’ll help out. 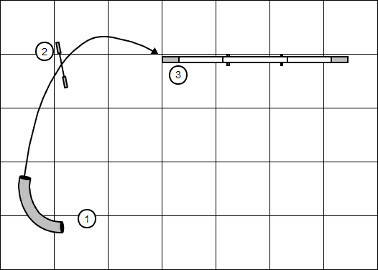 The red line coming off the dogwalk is the dog’s true path through jump #5. It won’t take much for the dog to run through the plane of jump #6 to earn the refusal. I set this sequence up for myself, frankly, because I’d very much like to solve these minor kinds of riddles myself in competition. Before you can solve the riddle of the dog’s path, you have to see the dog’s path. 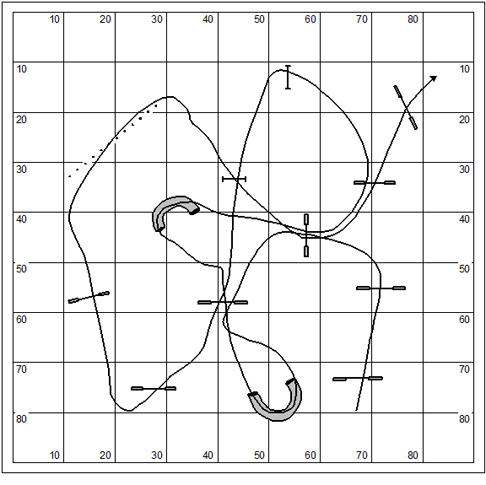 I’ve thrown away the sleepy/dreamy line drawn by the Clean Run Course Designer. 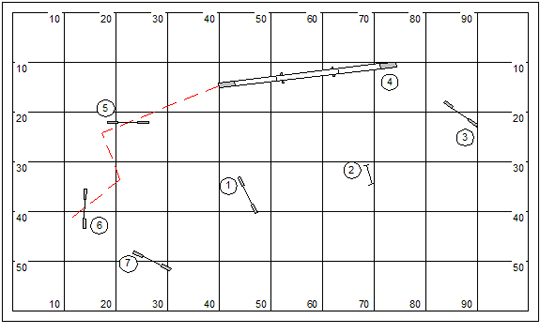 It was a pretty line, but doesn’t much help our analysis. 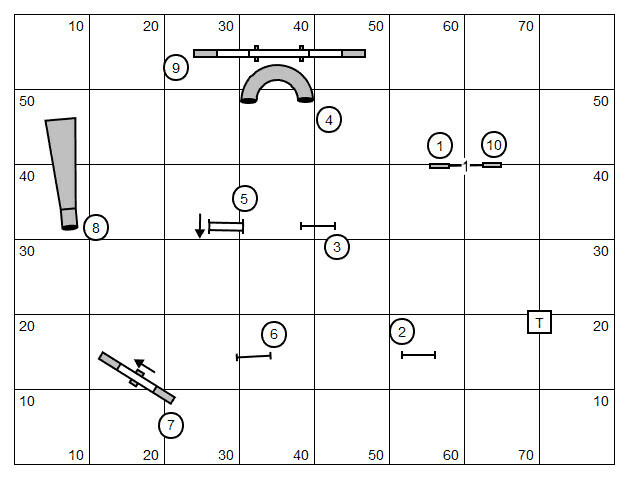 The dog’s path from jump #5 to jump #6 is a two-corner transition and requires a two-corner solution. 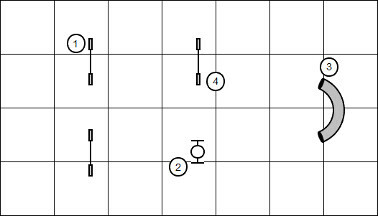 What I was playing with in my own practice of this sequence is using the “come-by” to solve. In the “come-by” I ask my dog to circle my body in a clockwise direction (come, by way of the clock). 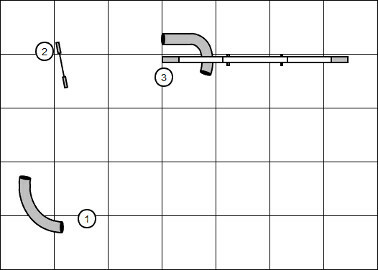 However there are a number of interesting compound handler movements that will solve. 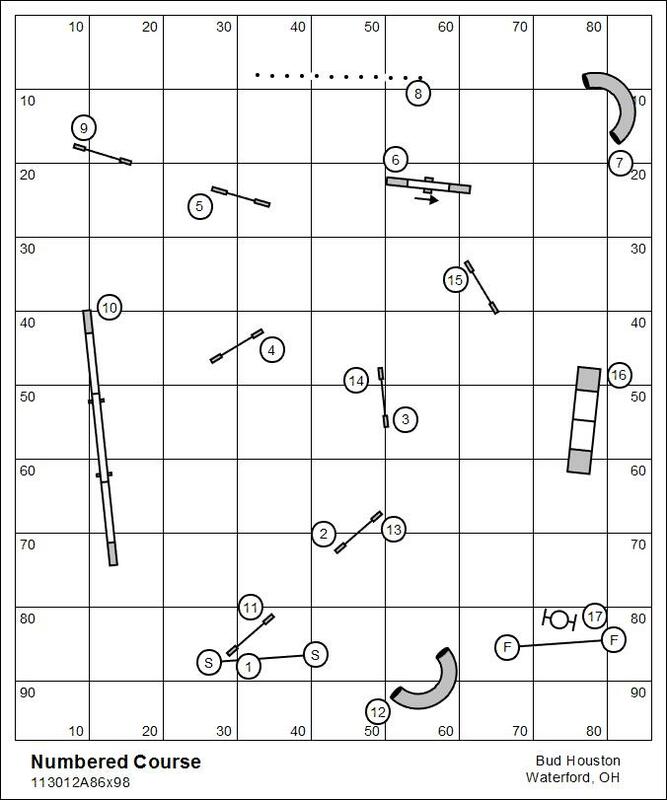 A handler might get away with a simplex movement (single-corner); but that’s all they’re doing, is getting away with it. The fail rate will be considerably higher than for handlers who see both of the turning corners. I’m working at launching a new, very low-key, recreational agility venue. 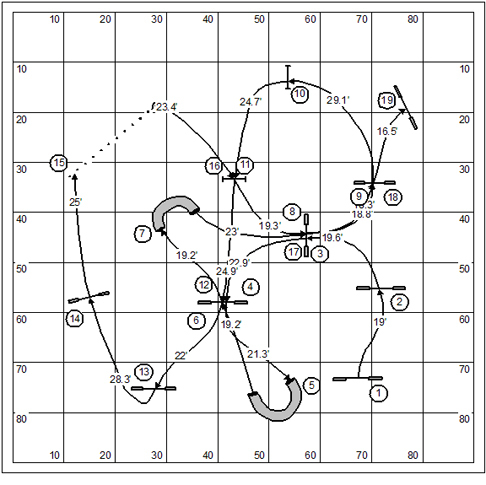 It has been my dream for many years to develop a recreational approach to agility that is affordable to just about anybody who wants to play. And I think I’ve finally got the correct model. I’ve started a “blog space” for the venue at: http://topdogagilityplayers.wordpress.com/. The rules will be published soon. Look for more information right here in my ongoing web log. I’ll tell it from my heart here. I’ll tell it from my brain there. 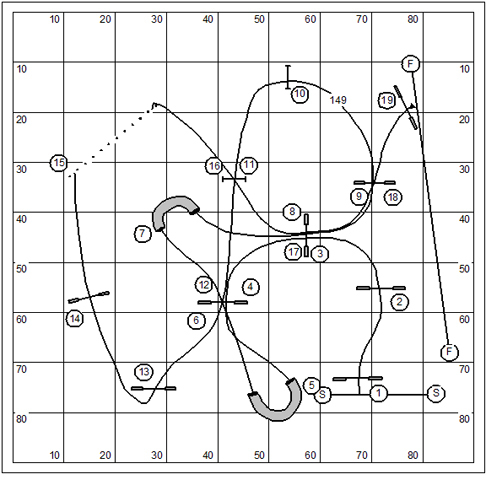 The Handling System is a notion growing in popularity in the dog agility world. A handling system is a form of branding that dictates the handler’s methods for crafting and conducting the game with his dog using the recipe of some notable authority in the sport. The subscriber to a handling system can be nearly impossible to teach. The more one-dimensional and dogmatic the system is then the less receptive the subscriber to adopt a balanced and rich repertoire of handling skills. A pity! The downside of any handling system is that it’s really impossible to put into that recipe the rich abundance of thought and skill and love of that “notable authority.” He cannot give you what he is. He can only sketch out that bleak commercial product. It’s hard to make an argument against the one true way. Always I’m left wondering why a famous handling system doesn’t allow for finding by scientific curiosity the correct mix of skills and methods for the individual dog. Whatever works is right. Right? I guess an open-ended system is not a system at all. And without the system we defy the mystique of the guru. More the pity. This is a short tutorial on how to use the CRCD Dog Path Tool for course design purposes. 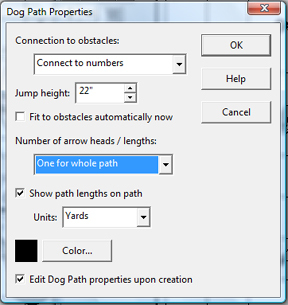 The Dog Path Tool is a button icon: The first in the second row on the left side of your screen. 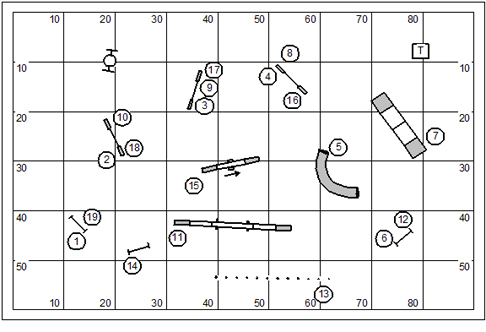 This tool has several distinct applications for course design: Freehand drawing (of the dog’s path); Measuring the distance between obstacles; and, Measuring the overall length of a course. This is a set of equipment laid out on the field. 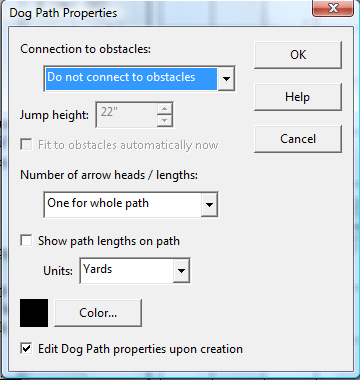 I would like to use the CRCD Dogs Path tool to draw a possible path for the dog. 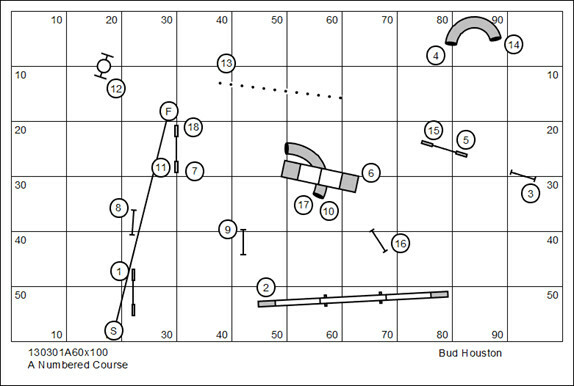 As a course designer, if I’m happy about it in terms of flow and challenge, I will number it and call it a design. Here I’ve drawn a path for the dog. 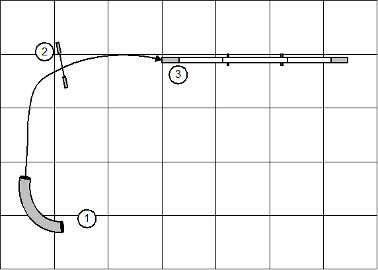 Note that as you draw you must hold down the left mouse button until the line is completely drawn. 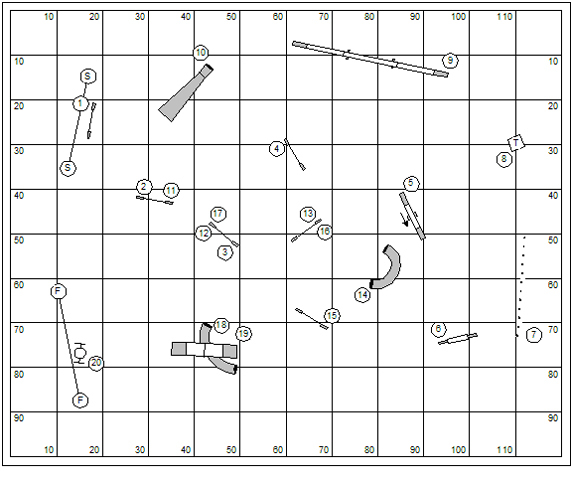 I’ve gone through and numbered the dog’s path that I had sketched on the course. 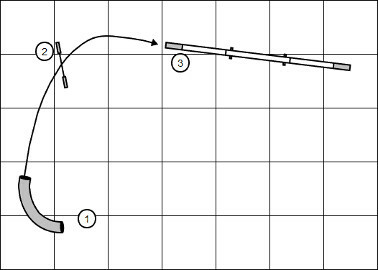 This view provides the opportunity to analyze transitional distances between obstacles. 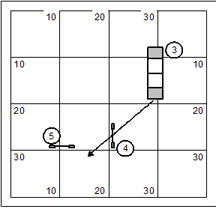 You can move an obstacle (and it’s associated numbers); the interval distance will change even as you move it. 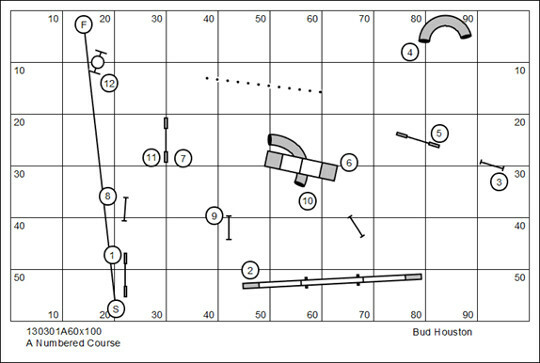 Once all of your equipment is where you want it and you are happy with the interval distances, you can use the CRCD Dogs Path Tool to measure the overall length of your course. 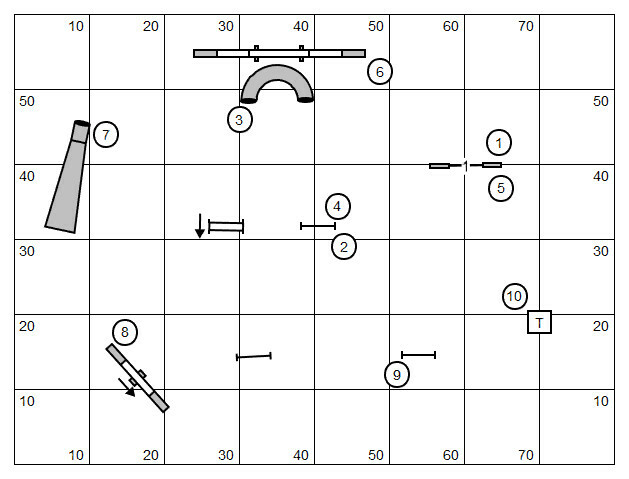 You should draw the Start and Finish lines first because the measurement should include the distance between the lines and the start and finish obstacles. The measurement can sometimes be hard to find. 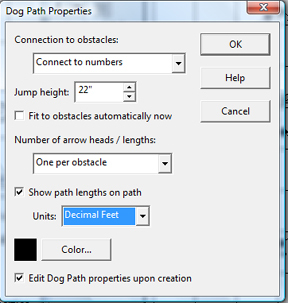 You may have to move around obstacle numbers in case the measurement number is hiding under it. 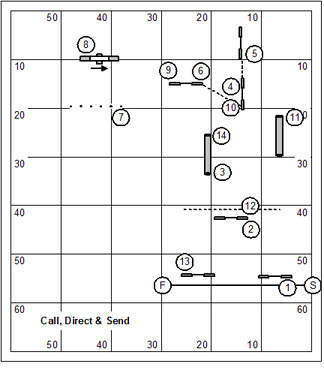 In this drawing you’ll find the notation of “149” yards in the space between the #10 and #19 jumps. 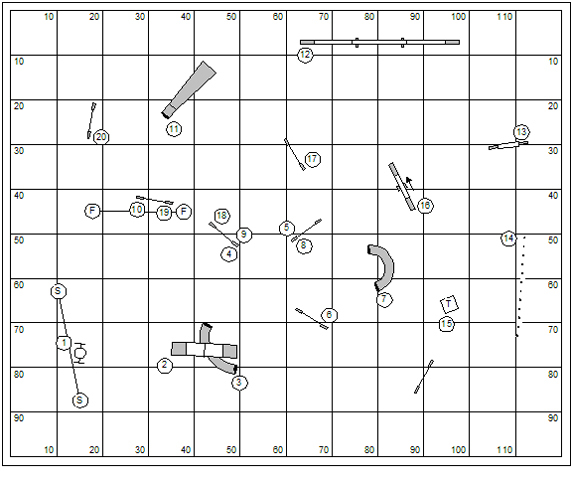 Note, by the way, that the Start and Finish lines have been drawn with some contemplation as to where the timekeeper should sit to get a clear view of both lines. I had intended to write today about a training/teaching model that I call “Breakdown”. 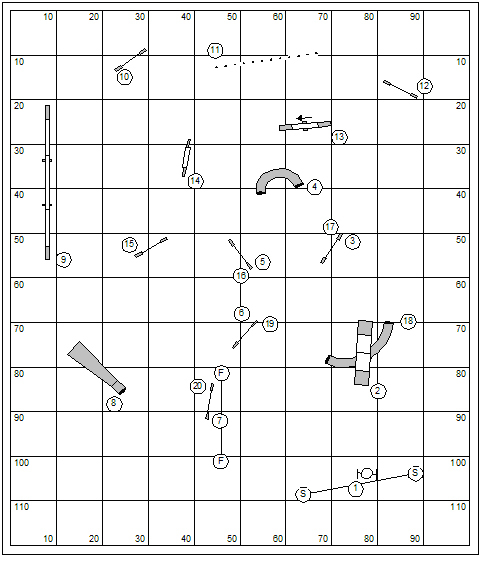 This course is based on specific challenges from a USDAA Grand Prix course that someone sent to me. 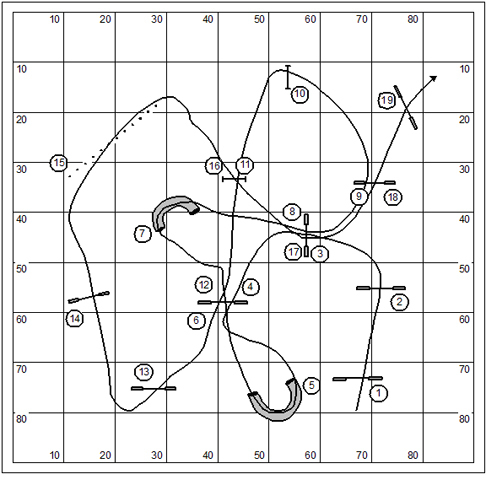 However, one of my TDAA judges sent a request that I explain how to use the Clean Run Course Designer Dogs Path tool to measure a course. I could take the hour or so it would take to tutor her on this… or I could share the tutorial with the entire TDAA Judges corps. I opt for the latter. 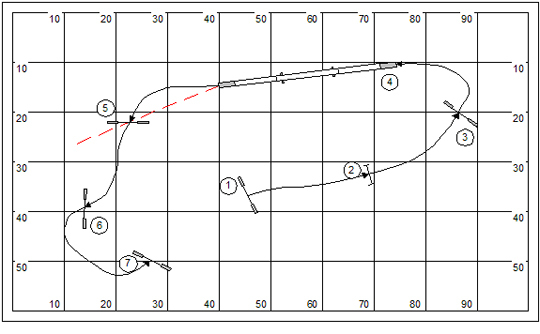 This blog then is dedicated to the TDAA Course Design College. 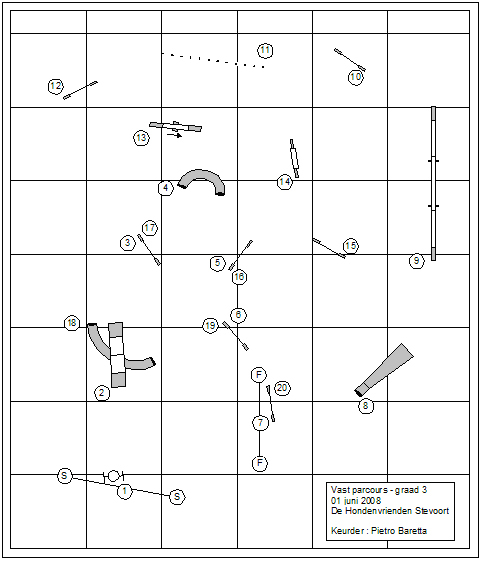 You are currently browsing the archives for the Clean Run Course Designer category.